In Dec 2012, while my first book (From the Rat Race to Financial Freedom) was still not published, the journey towards everlasting happiness had already started. 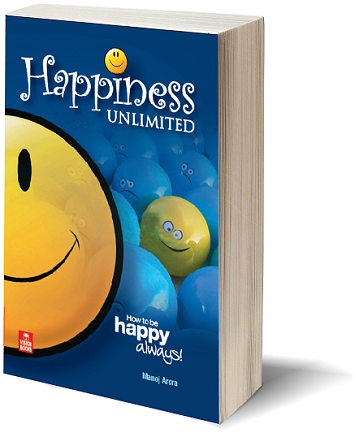 Yesterday, during the book launch, it was a major milestone to move forward in this beautiful journey towards unlimited happiness. We did multiple group activities as a part of the launch - to gather a few life lessons that will serve us in the times to come, and help us lead happier lives. (1) Who is responsible for how you feel in any situation? Even if someone fires at you, someone hits you, shouts at you, bangs your car, doesn't obey you or irritates you in any form you can think of - remember that how you feel after that trigger is always your own creation, and if happiness is important for you - you can decide to feel the way you want. Obviously this needs practice but it can be done. It is a myth that if there is a fight over an issue in a family, then it has to be someone's mistake. We saw that it is because of the past journeys from multiple births and experiences in this birth that each one of us behaves in a specific manner. And the fact is that it is no one's mistake - ever. (3) You cannot achieve anything alone. There are hundreds of known and unknown factors that have to sync together to make things happen for you. You do not control most of those factors, though you often take them for granted. Someone else by the name of GOD manages them. You better leave it to HIM what is not in your control. Understanding and absorbing the fact that you can only do sincere efforts, and do not control the result helps you experience happiness unlimited in your life. You don't need to look outside. Look inside and within your family. You will find enough celebrities which are helping you in your mission in life. It was a super gathering. Friends from far off places, relatives, family members - there are so many i wanted to thank...and i did try my best to thank them on Facebook...There were so many others who made an attempt but were stuck in traffic or school PTMs or other genuine family constraints. I know that they sincerely wanted to be there with me as we all set ourselves together to embark on this new journey. I have not achieved this. But I have made a sincere effort. The achievement becomes feasible only with each one of you supporting this great cause of elevating our society. You are in for a treat as we help thousands of people lead a happier life. We will all improve our quality of our lives as we learn to stay happy. Get set, and here we go..